Close-up shot of a Metro bus at a transit stop. Photo by John Schreiber. 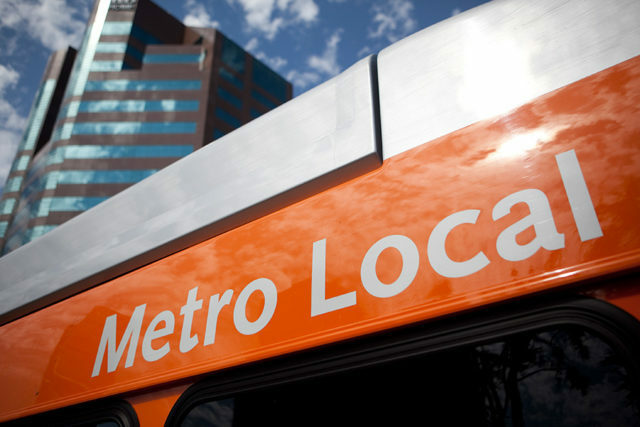 Metro announced Tuesday that it has received a proposal from a private company to develop and possibly expedite the placement of a rapid-transit bus line along Vermont Avenue from Hollywood to South Angeles. The proposal by AECOM and John Laing is the first Metro has received for the Vermont Avenue Transit Corridor. It’s the 11th private-sector proposal the transit agency has received for a project set to be funded by Measure M, the half-cent sales tax approved by county voters in 2016. The tax is estimated to generate $120 billion over the next 40 years. The Vermont corridor extends approximately 12.5 miles from Hollywood Boulevard south to 120th Street, just south of the Glenn Anderson (105) Freeway. According to Metro, the corridor is the second busiest in Los Angeles County, behind Wilshire Boulevard, with more than 45,000 weekday bus boardings. Metro’s Office of Extraordinary Innovation will assemble a review team to evaluate the concept by AECOM and John Laing. The Vermont Avenue Transit Corridor project would be designed to improve the existing bus line’s speed and performance, while relieving crowding and improving connections with other Metro services, such as the Red and Purple Line subways and Green and Expo Line light rail services. The project is scheduled to receive $25 million from Measure M and $400 million from other sources. Under the Measure M plan, it is scheduled to break ground in 2024 and is projected for completion between 2028 and 2030.